Adam’s show last night at the Highline Ballroom in New York City, part of the Rock My Town triple bill featuring HRH alongside Idol pals Alison Iraheta and Kris Allen, will be remembered as a milestone in his already astonishing rise. During Idol, thousands of viewers who had not been regular Idol watchers began to tune in weekly just to see what the “emo kid” would do. Early on, Adam promised to surprise us, and he delivered the goods. Week after week, he would compel us to watch, twisting up a classic, going against the flow, tackling iconic songs with reckless and exhilarating courage. Love him or hate him, you remembered him. Now, following months of media exposure (bordering on over-exposure? ), how would Adam surprise us this time? He sets the bar high for himself, and Highline’s intimate ballroom was a powder keg of anticipation. The crowd erupts when Longineu, Monte and especially Tommy (sporting pouty red lipstick) amble out on stage. Then Adam emerges from the shadows and strides into the light, sending the audience into a convulsion of shock and awed delight. Tonight he stands before us as glamrock avatar – beautiful and fierce bordering on grotesque – his eyes encircled in peacock blue glitter, with harlequin teardrops slashed vertically across each of his aquamarine eyes, and lips blackened, evoking the fierceness of a bird of prey. The hair hangs in spikes over his eyes and stands up on his head like the fur of an angry beast. His crown is thick with glitter, which spills down his neck and chest. He spins around and shows off the dark wings etched in sequins on the back of his jacket. Flashing on his chest, a large, silver pendant in the form of an eagle’s feather (an Alexander McQueen design – what a tasteful tribute). The New York crowd roars its appreciation. This is the Adam we’ve been waiting for – the Adam of the Zodiac Show, waving the freak flag of glamrock – and he gleefully displays his full, incendiary glory knowing this crowd will not be struck blind and dumb, but will love him back. The sparks ricocheting between Adam and the audience ignites the room, and we are off for the ride of our lives. (Thank the glam gods Little Rock did not win Rock This Town!). Xena is hard at work on her first-person report of this epic concert, and I have no wish to steal her thunder (lest she write me into yet another humiliating scenario), so I leave further details of the concert experience in her more than capable and brilliantly manicured hands. Suffice it to say that Adam exceeded all expectations, strutting, high-kicking, swaggering, playing sexual tic-tac-toe with us, working us until we were screaming his name, and delivering the coup de grace with that impish, sweet smile and Pan’s laugh of delight – wasn’t that fun? Poster “Halfie” (a rare hetero male Adam fan) on the Planet Fierce site makes an interesting observation about the infamous Rub. Did seem like Adam let those hands linger a moment longer than he would have if he really found it distasteful. Maybe he was playing with us. Then again, he could have just stepped back. Instead, he pushed those hands aside. I know we will be analyzing this for days! 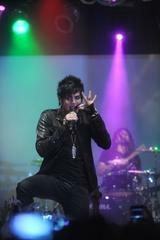 Saw the videos and ADAM WAS SCORCHING HOT!!!!!!!!! From 8000 miles away I can feel the heat. Sweating and awaiting more details. What an incredible experience, Juneau! He was FIERCE and fabulous and everything we had hoped he would be when all summer we kept saying just wait until he spreads those glittery wings! I’m sooooo happy I had the chance to see him there, so close, so intimate, so wonderful. It really wasn’t a dream! Even though I was very nearly fainter #4, I wouldn’t have missed a moment of it. I can’t wait for further recap! What a talent…. You goooo Adam !! !